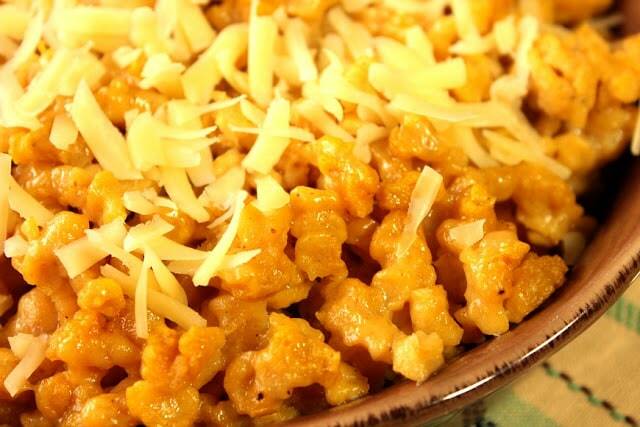 These soft and pillowy German Pumpkin Spaetzle with Gruyere Cheese dumplings may not be all that traditional, but they sure are tasty. When the cooler months arrive, I tend to gravitate to German cuisine as my comfort food of choice. It just speaks to me, and I hope it speaks to you too. 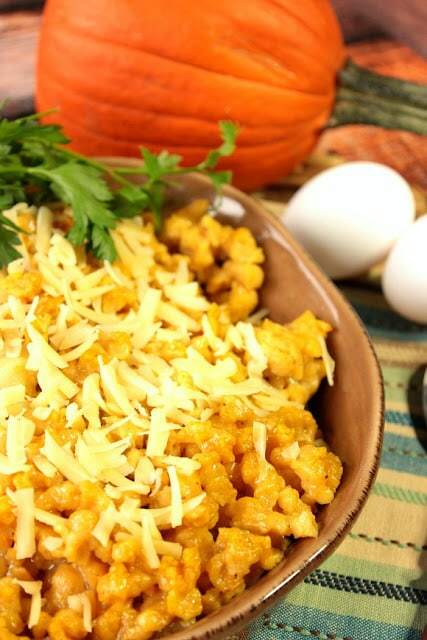 Pumpkin Spaetzle with Gruyere Cheese may look intimidating to make, but trust me when I tell you that it’s as easy to make as mixing the simple batter ingredients in a bowl with a wooden spoon, and boiling pasta. After all, that’s what spaetzle is, German pasta. Since I tend to make spaetzle often, I purchased a handy dandy spaetzle maker that you’ll see in the photos. However, if you don’t have one (and honestly they’re almost more pain and mess than they’re worth), you can use a standard kitchen colander with basically the same results. By making sure your batter is relatively loose, so it will easily funnel through the colander holes with a little help from a spatula, you’re all set. If you’re wondering how a spaetzle maker works, you fill the hopper with the batter when the spaetzle maker is over the pot of boiling water. Then you slide the hopper back and forth as the dough funnels through the holes and drop into the boiling water. It’s easy, but I always end up sliding the hopper too far off the side of the pot and then I have spaetzle batter all down the outside side of my pot. You’d think I’d learn, but I haven’t. -In a large bowl, whisk together the flour, salt, pepper and nutmeg. Make a well in the center of the flour mixture and add the eggs, pumpkin puree and beef broth. Stir with a wooden spoon until the mixture is somewhat thick but still loose and runny and will thickly drip through the holes of a spaetzle maker or colander. -Bring the water to boil. Add the spaetzle batter into the colander or spaetzle maker so that small drops of dough fall into the water. As they do they’ll drop to the bottom of the pot, but once cooked they’ll float to the top. This should take about 5-7 minutes. 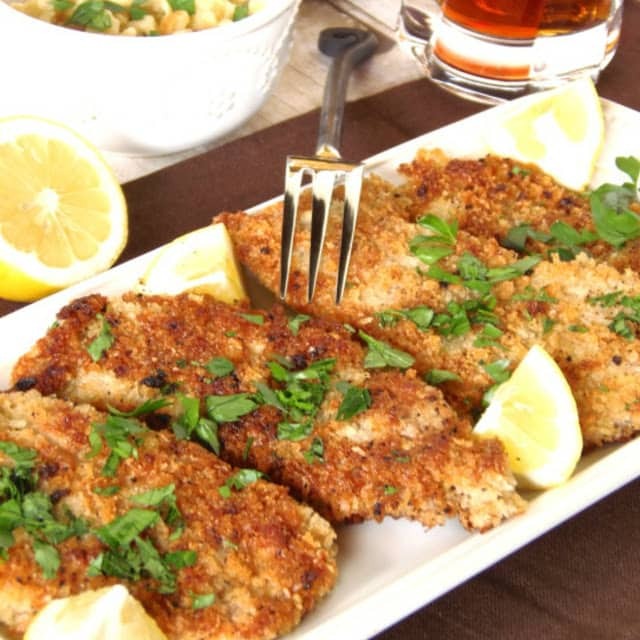 Remove the cooked spaetzle with a large slotted spoon and place in a casserole dish that has been sprayed with cooking spray. Drizzle the olive oil over the cooked spaetzle and stir well. 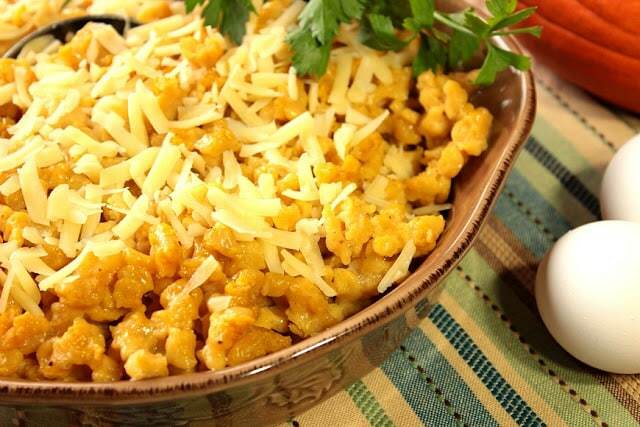 -Top the spaetzle with the grated cheese and bake in a preheated oven for 15 minutes to melt the cheese. 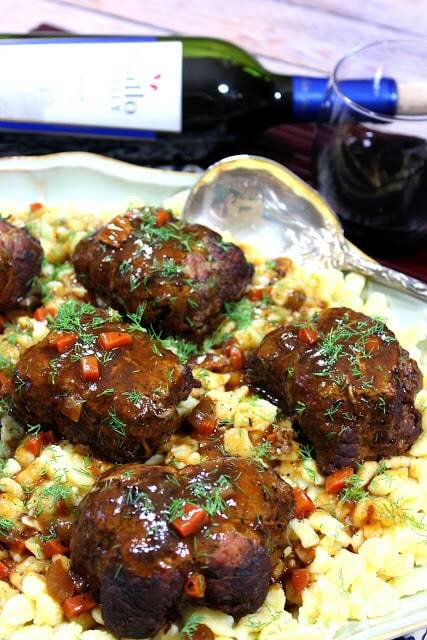 Top with parsley if desired and serve immediately. 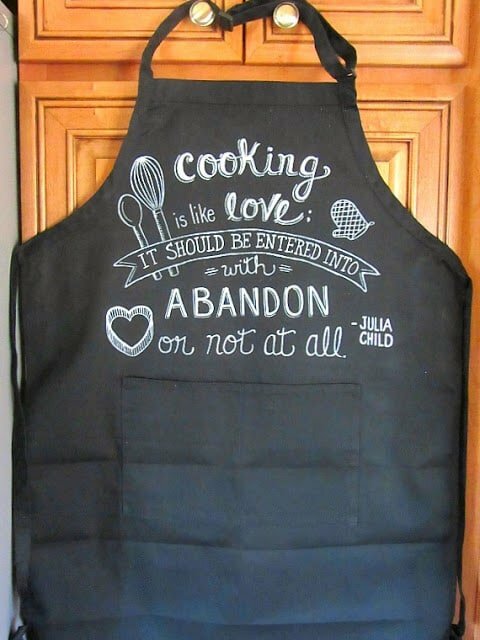 I don’t know about you, but now I’m seriously hungry and ready to start cooking! If there is ever anything I can paint for you, from fabrics to glassware items, please don’t hesitate to contact me or visit my shop on Etsy. Custom orders are always welcome and I will happily work from any photo or description you send my way. One meal I have never made but have recently seen a ton of recipes on spatzle, so I want to give this a try! It looks like something I don't think I would screw up, haha. 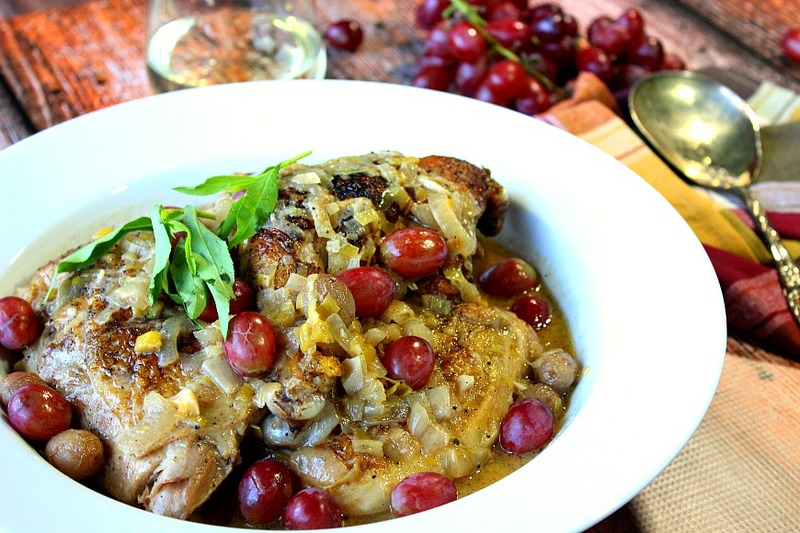 Love the nontraditional flavours in this recipe! Ok, I am intrigued! I now must try pumpkin with cheese! 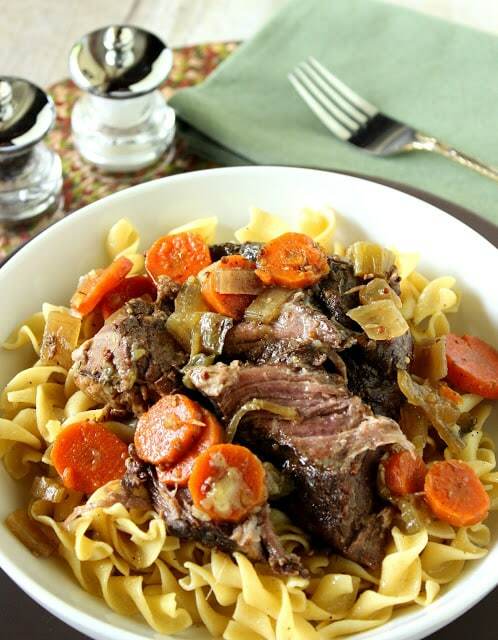 This sounds like pure winter comfort food! I have never made spatzle, but I think it is time. Lovely recipe. Iam loving all of the flavors is this dish! Pinning! I love savory pumpkin! This looks divine! I haven't made spaetzle in years—I think I know I coule eat a whole batch myself! Love the pumpkin twist—delicious!!! Yummy, these sound delicious and what an awesome twist for Autumn! You are one smart cookie. 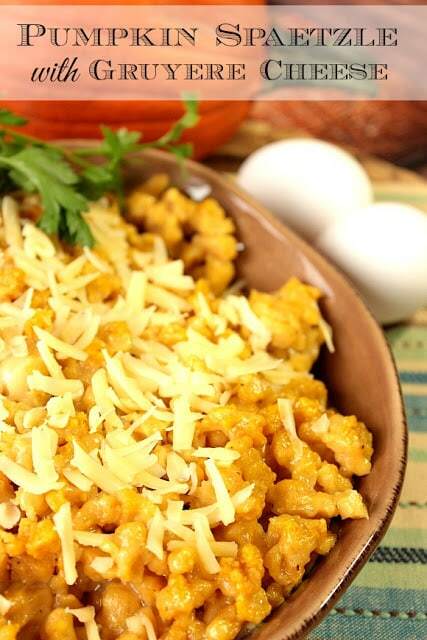 This spaetzle looks fantastic! Love the pumpkin addition. I love spaetzle! This is a brilliant twist! Making spaetzle has been on my list of to make for way too long! But now I want to try this pumpkin version too! I looooooove spaetzle – pure comfort food. And I'm so in love with the idea of a pumpkin version – I am totally making a batch of this soon. Beautiful! I've never made spatzle. I really should try. My daughter's best friend loves it. I should give this a whirl next time he visits. That sounds delightful. 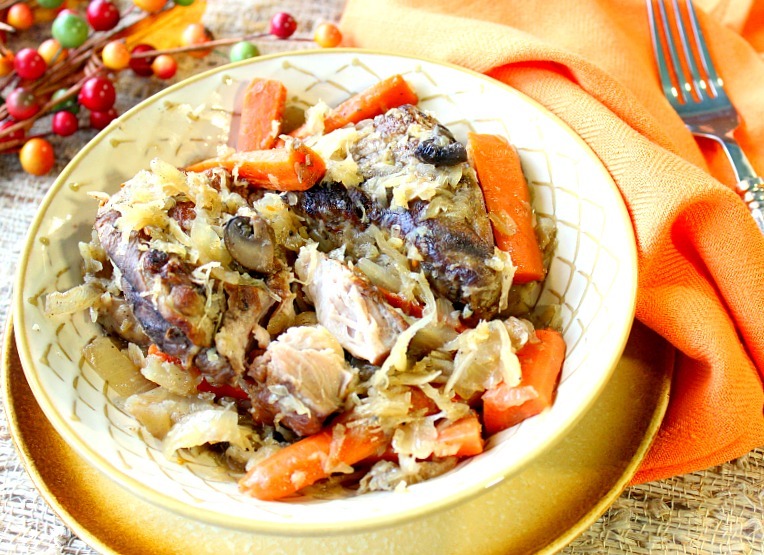 I also associate German foods with cooler temperatures — I think because that's when the wursts and kraut would hit the table when I was little. Wow! You have inspired me to make spatzle. My husband loves it and your pictures make it look so simple. Thanks for the inspiration. So I have always loved spatzle but have never made it. This has to change! Especially since you threw in some pumpkin….yum! 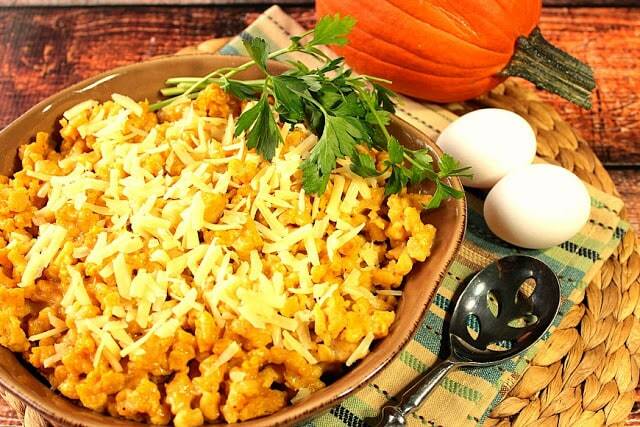 I, seriously, love spaetzle….you're a genius for adding pumpkin to it!